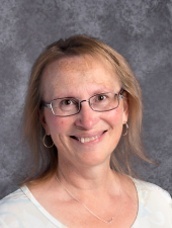 Mrs. Pam Williamson, Central’s first grade teacher, has been teaching at CLS since 2008. She attended Lutheran schools throughout her life and knows first-hand the blessings God gives through them. She is a 1979 (can it really have been that long ago?) graduate of Concordia University Chicago, and has taught in Lutheran schools for over twenty-five years, in six different schools. She has taught preschool, kindergarten, combined first and second, K-8 music and K-5 science. She came to the Cedar Rapids area when her husband accepted a call to be the pastor at St. Paul’s Lutheran Church in Marion. She loves being part of a Lutheran school where she can watch her students learn more about Jesus and grow in their faith. She appreciates the way everyone at Central works together to make the school a success, from the staff to the students to the parents who all go above and beyond what’s expected. She has a teacher daughter who lives in Wisconsin with her husband and adorable daughter. She also has a son who works at University of Iowa Hospitals and Clinics on their technology team. She enjoys playing the organ, spending time with her family, reading, watching good movies, and Josh Groban’s music!